Full instructions for applying your stencil can be found here (under Instructions tab). 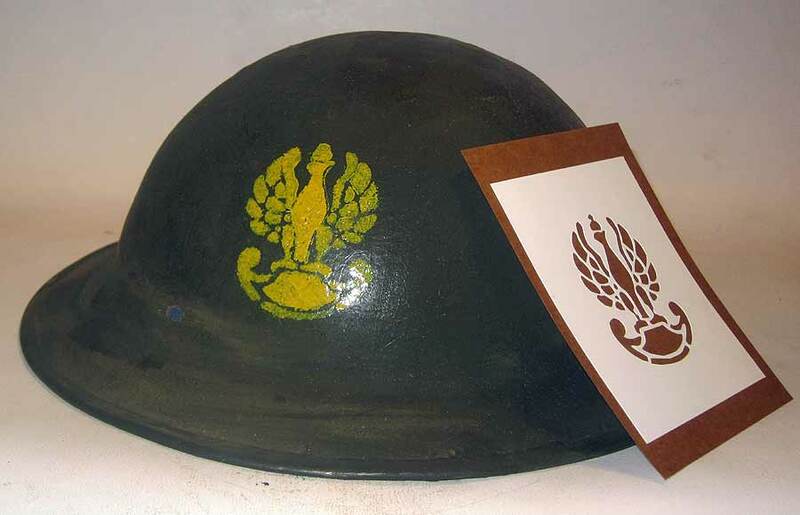 Helmet stencil for the 6eme BPC (6th Colonial Parachute Regiment), French Paratroops. The stencil is a rare type used by French paratroopers during the Algerian war of 1956-62. The colonial paratroops were unit's made up of soldiers from France's colonies such as Morroco, Mali, Algeria, and Tchad. 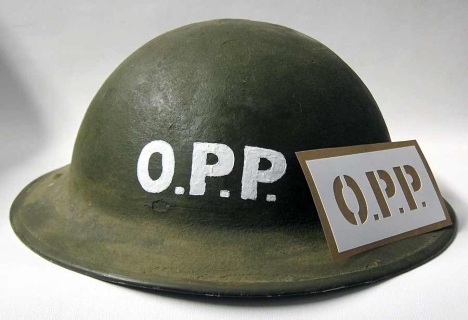 France had 3 types of paratrooper unit's. Metro paratroops from France, colonial paratroops from the colonies, and foreign para regiments from the French Foreign Legion. This is one type of several variations. This stencil is suitable for hand or spray painting. Chinese KMT (Kuomintang of China), stencil used on M35 German Helmets supplied to the Chinese by the Germans and painted generally by the Germans before shipping to Japan. There are some with decals but the vast majority are stencils, just like our accurate version. Used in the Sino-Japanese War, China at that time having a close relationship with Germany. Soviet WW2 helmet stencil as used by the Soviet Navy on each side of the helmet. This stencil is really simple to apply either hand or spray painted. 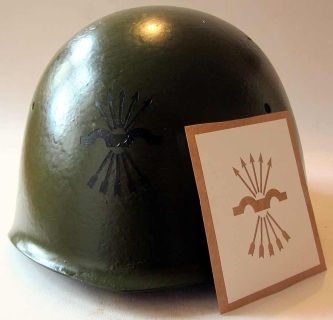 This is the only stencil for "The Borinqueneers" worn in the Korean War. They are a Puerto Rican regiment of the United States Army. The regiments motto is Honor et Fidelitas, Latin for Honor and Fidelity. 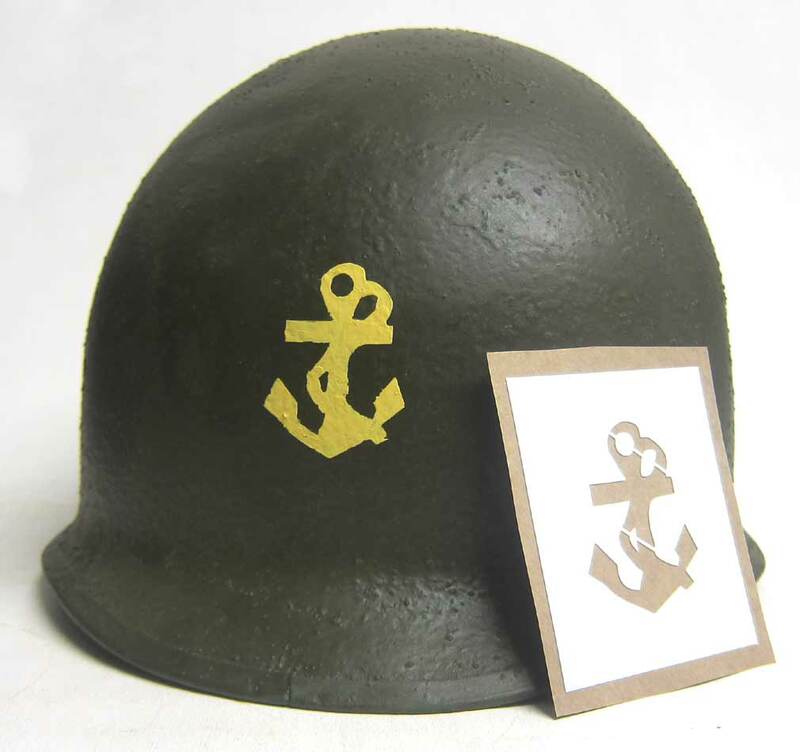 The 65th Infantry Regiment participated in World War I, World War II and the Korean War & still serve today. 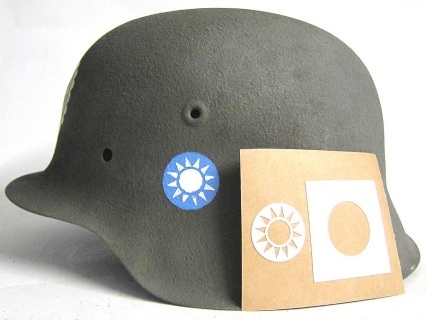 This the Korean War version of the stencil worn on the left of the helmet. The Third infantry stencil was worn on the right hand side. 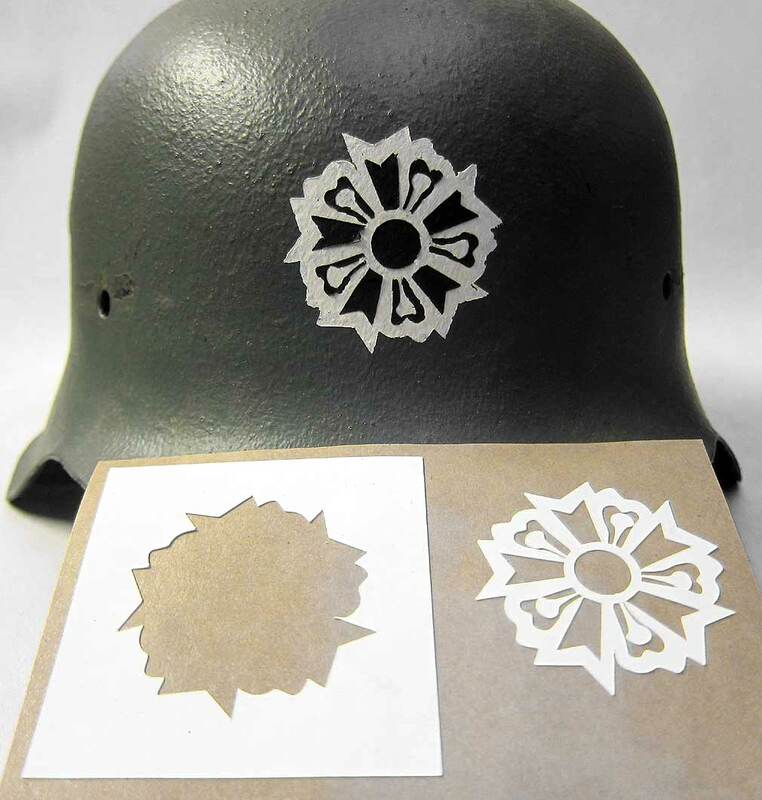 The WWII & Third Infantry Division versions are on our 'WW2 American Stencils' page. 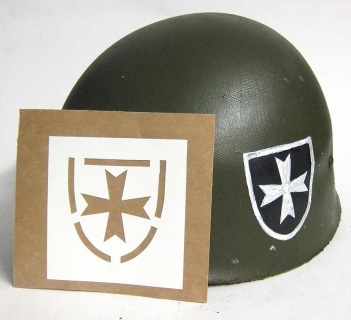 This stencil marking (Polski Szablon Spadochroniar) and other variations, were used on British Tommy & Para helmets by the Polish armed forces in WWII. The stencil is made from very high quality acrylic vinyl with tacky backing, which in laymans terms means its re-usable. 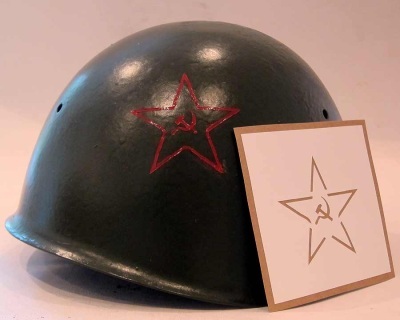 Can be used on Russian War Helmets to create the star, hammer & sycle Russian Party insignia. It can be used to create the hammer and sycle and hollow star but also the solid star used into WW2. During the Spanish Civil War, it is thought that as many as 60% of the original members of the Falange were killed fighting for Franco. 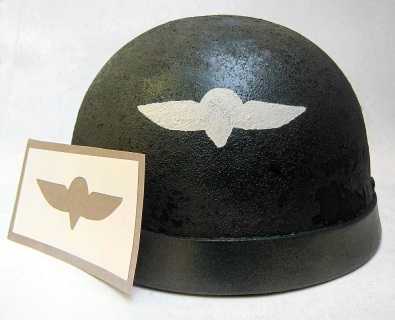 Between June 1939 and July 1942, the Grand Council of the Falange served as the principal legislative body in Spain and was answerable directly to Franco. 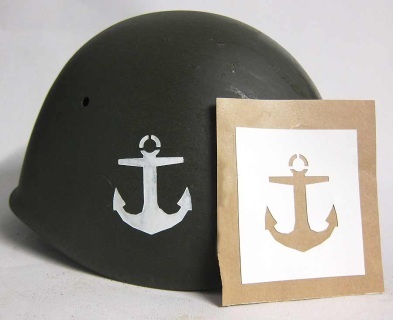 We can make up pretty much any helmet stencil you want, just email us and ask.